I know, I know...it's been a slow blog month for me. Just when i thought I'd have all the free time in the world, little things started popping up - apartment searching, catch-up schoolwork, weekend trips - that have been keeping my posting at bay. Luckily I've still had ample time to cook, and in addition to some new sweet baking experiments (recipes coming soon, I hope! ), I've been playing around with bread doughs, too. And I'm not just talking about whole wheat pitas, either. I do love my whole wheat pitas, and I especially love the versatility of the dough, but my last creation took flatbread to a new level. For one, I used a special secret ingredient in the dough. More importantly, though, I created my first original yeasted dough recipe. Most of the chemically-leavened recipes on this site are my original recipes, and I've gotten pretty comfortable baking on the fly, without a recipe, recording measurements as I go. Yeast, though, has always been a tricky thing, and I've mostly stuck with other people's guidelines when it comes to making pizza, pita, or bread. Ever since the last pita episode, though, I've been looking for a good day to make more flatbread. 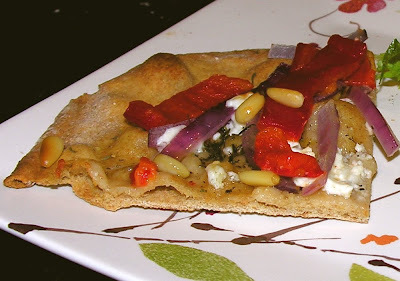 The idea of a Mediterranean pizza seemed to be stuck in my head, and I wondered if I could incorporate some of that inspiration into the dough itself, and not just the toppings on the bread. Thus my garbanzo dough was created. I was hoping to get a real chick pea flavor in my dough with the addition of garbanzo flour. Honestly, I can't say that I'd be able to pinpoint garbanzo as the distinctive flavor of this dough, but it really was much more flavorful than ordinary dough. It turned out to be the perfect backdrop for a host of different toppings, including spinach, red onion, roasted peppers, herbs, and feta. I made the dough with a sponge in the hopes of it imparting a certain richness in flavor that straight doughs often lack. Although it sounds complicated, a sponge is like a pre-dough made with all of the liquid, part of the flour, and the yeast of the recipe, which allows the yeast to develop a bit before the addition of more flour and other flavoring agents (salt, oil, etc.). The sponge entails an extra rising period, but this recipe is pretty flexible - I made it on a day when I was in and out of the kitchen, and all of the rising times are approximate. I've said it before and I'll say it again: it's pretty hard to mess up a flatbread dough. The dough mixed and rose beautifully, and was particularly easy to roll out for thin, almost cracker-like pizza crusts. A combination of garbanzo, white whole wheat, and whole wheat flours resulted in a lower gluten content and thus a slightly less elastic dough than a traditional wheat dough. After a few minutes on the pizza stone, the crusts were golden, crunchy, and slightly bubbly around the edges, but the interior was thin and a bit chewy. We took the dough in a whole bunch of directions, so it wasn't just plain old pizza, either. We made several smallish thin-crust breads, some with spinach and ricotta, and some with peppers, onions, and pine nuts. We also did a "deep-dish" risen-crust pie with sausage and mozzarella (guess who ate that one?). We tried out a wee calzone with ricotta, tomatoes, and spinach, and even made a little garbanzo griddle cake that Jonathan ate with scrambled eggs for breakfast. Next time, I think I'll make a huge batch of this dough, and stash some in the freezer so that when I'm struck by a garbanzo griddle cake craving (they happen to the best of us), I'll be totally prepared. Seriously, though, this dough is awesome. Try it! Prepare sponge: mix dry ingredients in a large bowl, and add warm water. Stir for a few minutes, until thoroughly combined. Sponge with be very wet. Let sponge sit, covered, for about 45 minutes, until bubbly. Add salt and oil, and then start adding additional flour. 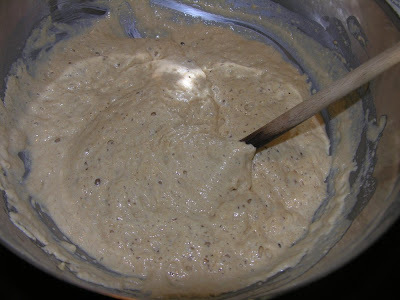 Stir in about 2 c. of flour, adding more until dough is too stiff to stir with a wooden spoon. Turn out the dough and begin kneading, continuing to add flour until it is just tacky and smooth. Return dough to bowl and cover with oiled plastic wrap and a dish towel. Let rise until about doubled in bulk, 1 1/2-2 hours. Punch down dough and either roll out for pizzas or place in a sealed plastic bag and store in the refrigerator until ready to use. Makes enough dough for about 6 smallish, thin-crusted pizzas.